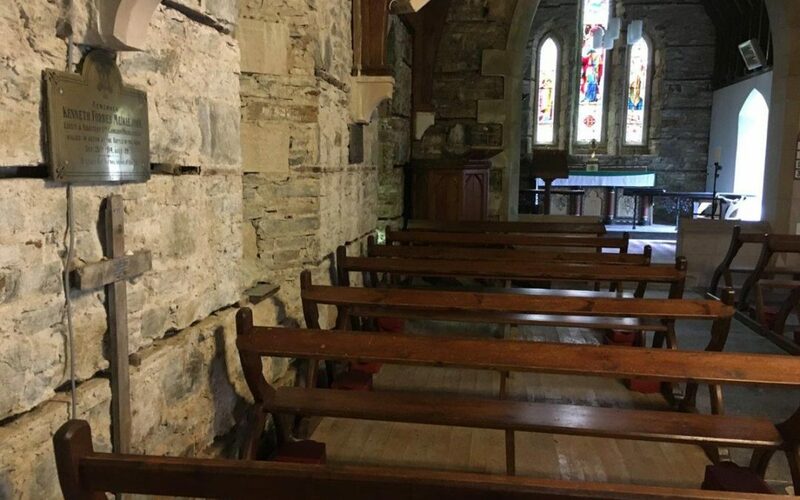 In St Finan’s Church, Kinlochmoidart is a WW1 wooden grave marker bearing the name of ‘Captain Kenneth Forbes Meiklejohn, of the 1st Cameron Highlanders and the date of his death as 26th September 1914. It also bears the initials G.R.U., which stand for the Graves Registration Unit, which was formed a year later*. The details are stamped onto nailed-on strips of aluminium produced in a penny-in-the-slot label maker of a type once a feature of large railway stations, a photograph is attached showing a restored machine of the same type, now in the National Railway Museum, York. Kenneth was newly married to Sibyl Maud Stewart, only daughter of J C Stewart of Kinlochmoidart. She was an aunt of Nino Stewart, the present owner of Kinlochmoidart, who remembers her as a tall and elegant lady. The following account is on the internet: ‘On September 26, 1914, Meiklejohn, his commanding officer, three other officers and twenty-five enlisted men were buried alive and killed when a shell burst atop the cave in which their headquarters had been established.’ According to Nino, her father had been in this cave shortly before the explosion; he then faced a very difficult situation, not only losing his brother-in-law but also having to cope with the loss of the regiment’s entire administration staff. Above the cross is a brass plaque giving slightly different (and correct) details: the rank given is Lieutenant & Adjutant and the date of his death as 25th September 1914. Lieutenant Meiklejohn and his comrades were reburied after the war in a small cemetery at Vailly (369 graves), which now seems to be in suburban surroundings. The Aisne became part of the Front Line and was fought over for the rest of the war, in 1918 another battle was fought there in which many American troops were killed; later they were interred in the Oise-Aisne American Cemetery (2289 graves). Kenneth Forbes’ father, Col. J. F. Meiklejohn (born 1839), married Edith Mary Dives in 1873. 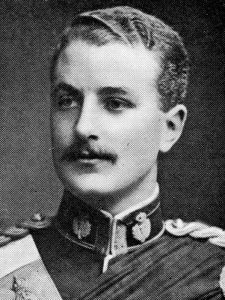 He served mostly in India in the Royal Horse Artillery (in some references abbreviated to RFA although the Royal Field Artillery was not formed until 1899) and retired in 1885 (the year Kenneth was born); he died in 1925. Kenneth was born in Woolwich (some documents say France) in 1885 and he had an older brother, Ronald born at Rawalpindi, in 1875, who married, in 1903, Kathleen Stella Myburg, daughter of the (Afrikaner) Ottoman Consul at Cape Town. They subsequently lived in South Africa, but he returned when WW1 was declared and was taken prisoner at the Battle of Mons but later served in the Russian Expeditionary Force in 1919. Both Kenneth and his brother were ornithologists of some repute. When Kenneth Forbes Meiklejohn died, his wife, Sibyl, was pregnant and she gave birth to a son, Kenneth Matthew Meiklejohn. He went on to have a military career like his father and grandfather: he was a Captain in the Royal Artillery in 1945, he died in 1998. Sybil Meiklejohn remarried in 1916, to Captain Lancelot C. Pitman, Royal Engineers (who also held the position of Adjutant), from Christchurch, New Zealand. He survived the war and is recorded as Lieutenant Colonel Lancelot C. Pitman in Chelsea in 1942. She stayed at Kinlochmoidart during World War 1, and they had a son, Leslie Colin Pitman, born at Kinlochmoidart in 1917. Apparently he was brought up at Kinlochmoidart with his half-brother. He died as a Major in the Cameron Highlanders, in Egypt in March 1943. You can see the record for the cross here. Supplied by Scott Galloway, with thanks to John Dye for writing the original piece.